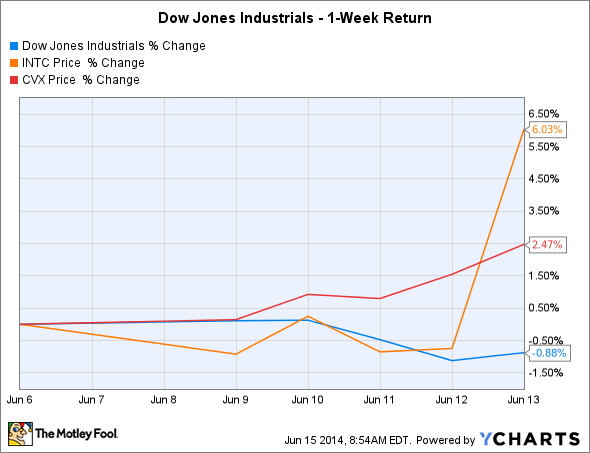 Even though the Dow dropped last week, these two stocks produced big gains. Find out why. After a long winning streak, the Dow Jones Industrials (DJINDICES:^DJI) finally gave up ground last week, with a modest decline of just less than 1%. A rise in geopolitical tension came from a somewhat unexpected direction as unrest in Iraq flared into a near-disintegration of the nation's military force, and that has investors on edge that a response from the U.S. and other Western allies could recommit resources and personnel to the area. Yet even though those fears hurt a large part of the market, Intel (NASDAQ:INTC) and Chevron (NYSE:CVX) posted solid gains during the week for two very different reasons. Intel's 6% gain on the week came after the chip giant revealed a surprise of its own: PC demand has been much stronger than most investors had expected over the past few months. Intel boosted its second-quarter sales guidance by 5%, and it now expects at least some positive movement in its overall revenue for the full year after having initially projected that its sales would be largely unchanged. That news reversed a long-term trend in the PC market, with the company having seen consistent declines for years as consumers moved away from PCs toward mobile devices, in which Intel's development has lagged behind other chipmaker rivals. The big question for Intel is whether this rise in demand will be sustained. Some noted that the fact that the old Windows XP operating system is no longer getting support could have prompted would-be holdout business customers into finally upgrading their systems. If that's the primary motivating factor, then Intel could easily see a one-time spike that gives way to the longer-term downtrend in the industry. On the other hand, if business customers actually get a boost in productivity as a result of their increased spending in the area, then Intel might see a growing wave of business from buyers looking for similar gains. From this week's share-price jump, Intel investors are counting on the latter being true. For Chevron, the rise in oil prices that accompanied Middle East tension helped pull shares up by 2.5% on the week. Chevron's revenue and profits are highly dependent on the prevailing price of oil and natural gas around the world, and when supply and-demand factors favor higher oil prices, Chevron and its oil-giant peers necessarily benefit. Of course, if Chevron's major production areas were affected by the cause of the oil-price rise, then the hit to earnings would offset gains from higher prices. Chevron has some exposure to Iraq, with recent efforts to drill exploratory wells in the Kurdish region potentially in danger as a result of the conflict. Yet growth opportunities abound in other parts of the country, and although Chevron faces the constant pressure of finding new resources to replace dwindling production from played-out wells, those who expect higher energy prices to persist should likely see Chevron stock as a bargain.